Steek it! | A creative life tangled up in lovely yarn! Steeking is when you knit a garment in the round, across the armholes and neck opening. When you have finished you secure the stitches along the opening by crocheting of sewing stitches by machine. The steeks refers to stitches cast on to provide something to cut in and enough to fold back and hide the frilly edges after cutting. You might ask “why would you do that?” The answer is simple; if your do colour work it is much faster to work in the round, rather than work back and forth. I am talking much faster! 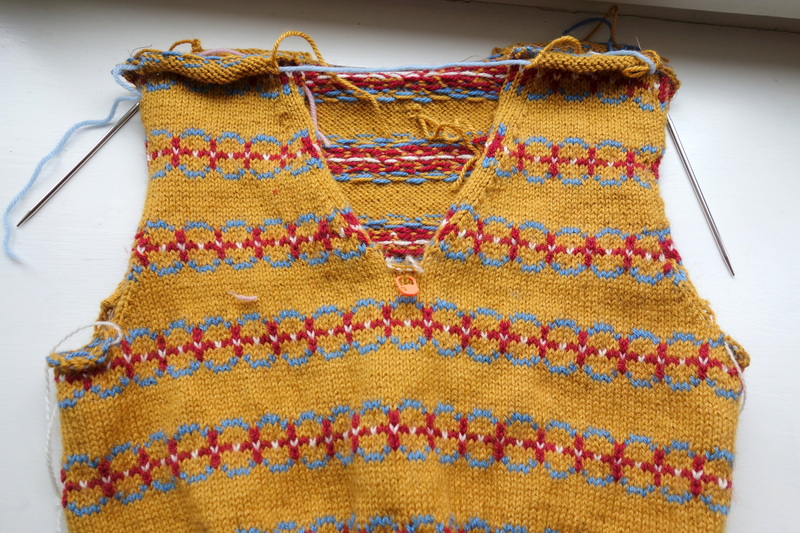 I am not new to this, as most traditional Norwegian sweaters are knitted as a tube and armholes cut open to fit the sleeves. What I am new to is shaping a garment at the same time. 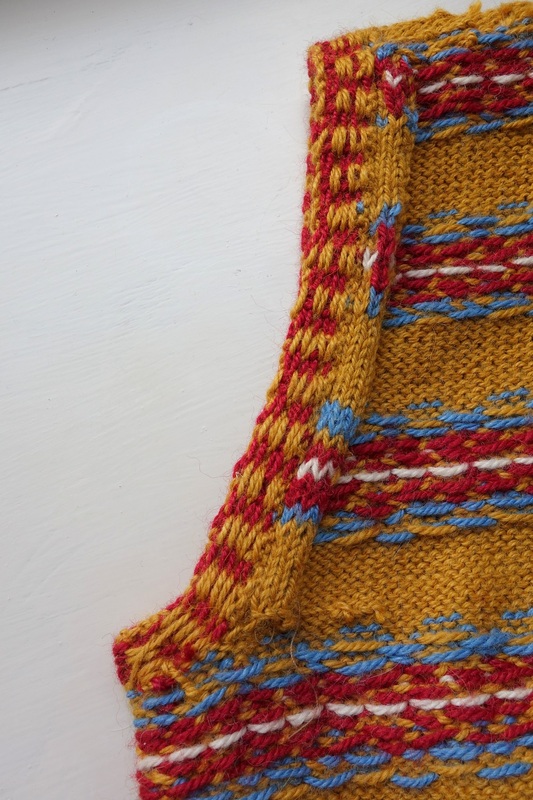 A Norwegian sweater has no shaping, while a snug fitting fair isle vest has armhole shaping and a neat V-neck. I have wanted to try shaping and steeking for a long time and recently I had a go and it was easy and fun to do. I want to explain the process of steeking in case you like to have a go. When you get to the armhole shaping your set the number of stitches you would cast off if working back and forth on a holder. Using the back loop method, cast on an odd number of stitches (nine stitches are good in sports or DK weight yarn). For a V-neck you would set the three middle front stitches on a holder. 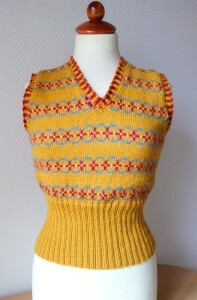 Keep following the pattern and shape armholes and front neck as stated in the pattern. The steeks should be worked in alternate colours starting and ending with the main colour. 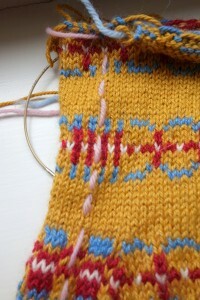 Your steek will be striped in the colours you are working the pattern in each round. When you have have the length you want cast off the steeks and leave the rest of the stitches on holders. And now come the fun part! The steek with scrap yarn basted in to indicate the middle. 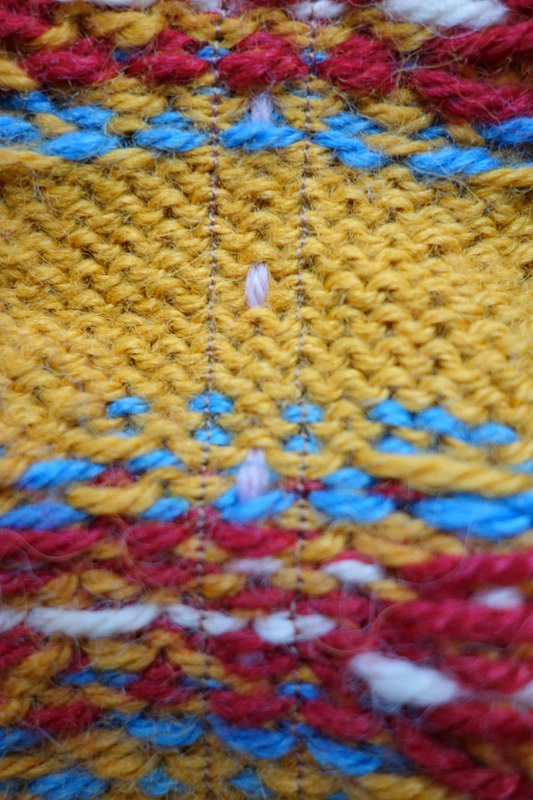 With some scrap yarn in a contrasting colour stitch down the middle stitch. This will make it easier for you to know where to sew or crochet. Now you can choose betwen the crochet hook or the sewing machine. I used the sewing machine for this project since it is knitted in an alpaca/silk bled that is more “slippery” than a wool yarn. With yarn in main colour work a row of double crochet (US single crochet) on either side of the middle steek stitch like this: Insert the hook picking up the right side of one stitch and the left side of the middle stitch. Wrap the yarn around the hook and draw through to create one loop of yarn on the hook. Wrap the yarn around the hook again to create one chain. Insert the hook through the next pair of stitches. Wrap the yarn around the hook and draw through the stitches to create a loop on the hook. There are now 2 stitches on the hook. Wrap the yarn around the hook again and draw this yarn through both loops on the crochet hook. 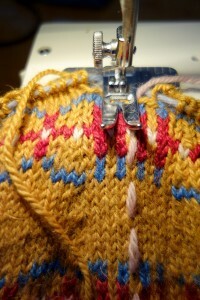 Continue to the end of the steek, turn and repeat on the opposite side of the middle stitch. When you have completed the crocheting you will have two rows of crochet side by side with a “ladder” in between. This is where you cut open the armhole or V-neck opening. Sew down the middle of the stitch closes to the scrap yarn marker. 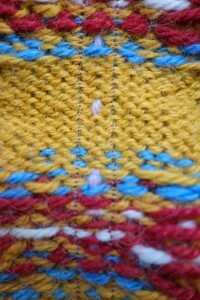 With the stitch length adjusted to short, sew down the middle of the stitch closest to the scrap yarn marker. Do the same on the other side of the middle. Here you can see the stitches and how they “lock” all the yarn so it want come undone. I have included a photo of how it looks like on the wrong side after sewing. It is hard to see the stitched on the right side as they are in between the knitted stitches. Now it’s time to get those sharp scissors out. Cut down the middle in between the sewn or crocheted stitches. What more can I say? Be careful not to cut across the sewn or crocheted lines! Voila! Suddenly it looks like a vest! Graft the shoulder stitches. Pick up stitches and knit the armhole band and neck band before you turn back the steeks. The steek is folded back to cover the cut edge and stitched in place. looks like nothing has happened here! 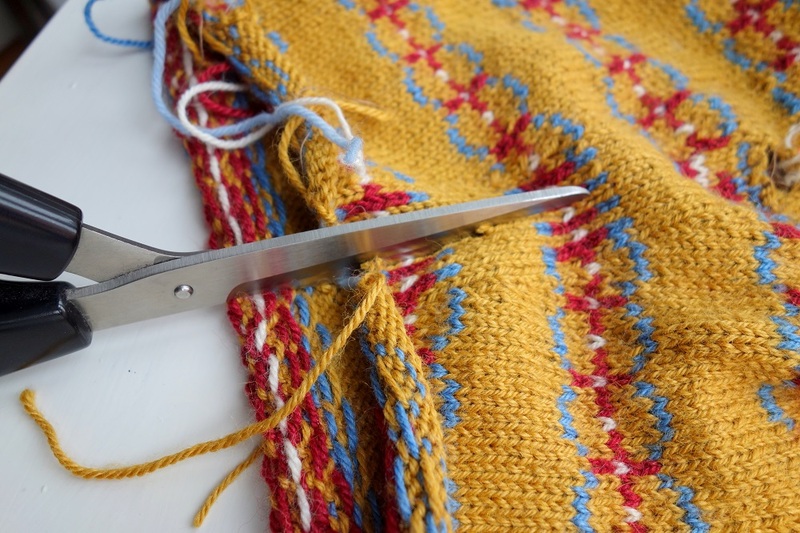 When the bands are knitted, turn back the steeks so that the cut edge folds in under the rest of the steek. Sew in place. It is actually great fun to knit colour work and steek! I have never experienced that the sewn or crocheted edges have come loose, so do not be scared to try this. 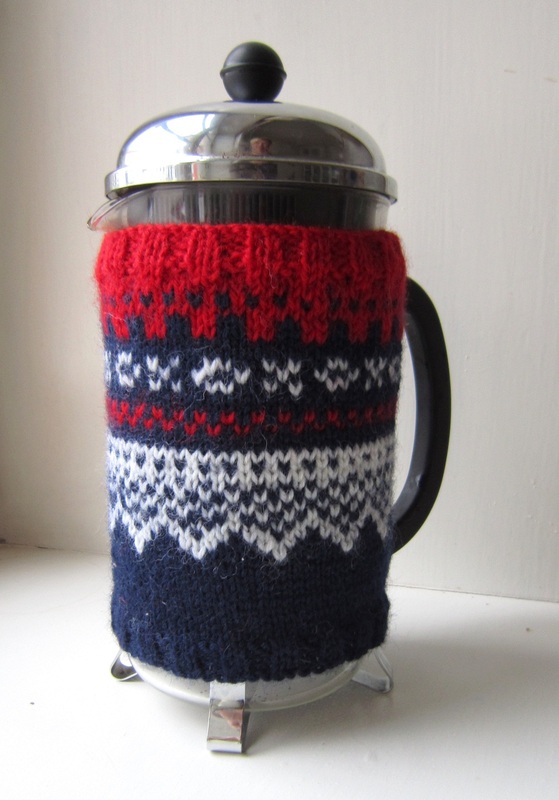 If you want to test out steeking on a quick project, try a coffee maker cosy! If you want to try steeking a smaller project you can try a coffee maker cozy. 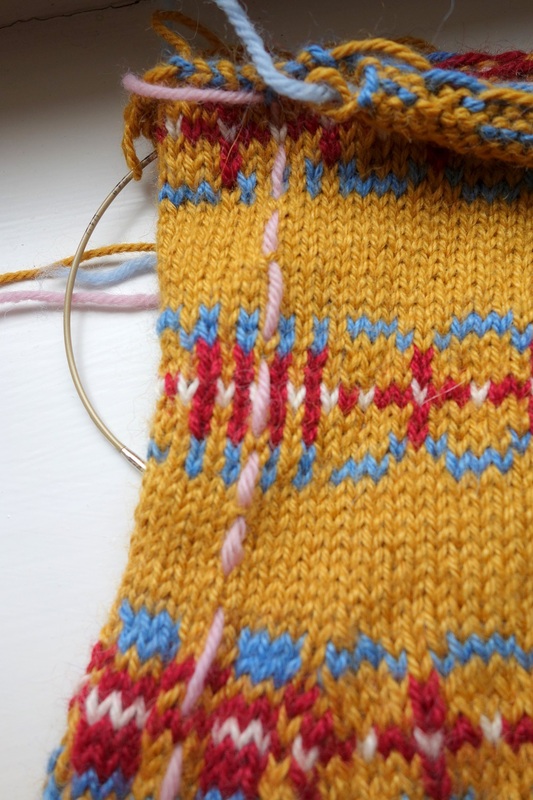 Cast on the amount of stitches you need and knit a patten you like – and do it in the round! Cast on stitches for the steek and knit the these stitches in stripes. When you have finised; steek!